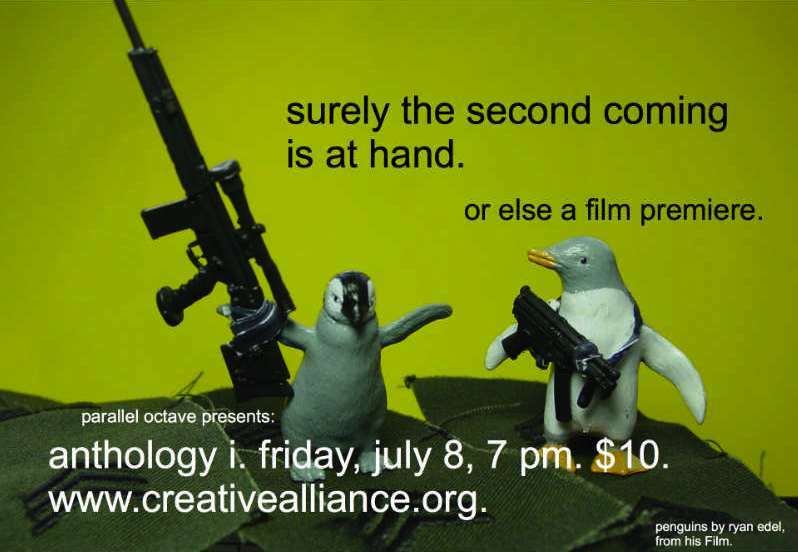 Yes, penguins, tomorrow is the last day to buy your tickets ($10) to the July 8th ANTHOLOGY I premiere before June 15 and receive buckets of free merch. Tickets here: Creative Alliance, 410-276-1651. Those who purchase by June 15 will receive a free Decadent Parallel Octave Party Favor Bag at the event, containing gourmet Baroque Popcorn Balls by a local chef, a limited-edition CD of the ANTHOLOGY I soundtrack, a kazoo, a Purim noisemaker, condoms, Pop Rocks, and more outlandish surprises.